A gunfight broke out inside the crowded Cameo club early Sunday, leaving one man dead and 15 other people wounded, according to police. The operator of a Cincinnati nightclub calls the shooting that took place there, "senseless." Police say a gunfight broke out inside the crowded Cameo club early Sunday, leaving one man dead and 15 other people wounded. They say a dispute among several patrons escalated into a shootout. Club operator Jay Rodgers released a statement Sunday night, saying he's "deeply saddened" by the shooting. He says the club will continue to work closely with law enforcement to "make sure the monsters that did this are caught and brought to justice." Rodgers says the club will remain closed until the investigation is complete. Police have identified the victim as 27-year-old O'Bryan Spikes. 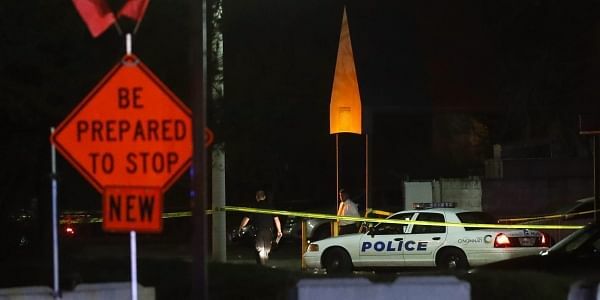 At least five people remain hospitalized, two of them in critical condition, after a Cincinnati nightclub shooting that killed one man and left 15 people injured. Police have identified the name of the person killed in an overnight Cincinnati nightclub shooting that also left 15 people injured. The victim was identified at a news conference as 27-year-old O'Bryan Spikes. Police say calls came in of shots fired at the Cameo club around 1:30 a.m. Sunday. Police Chief Eliot Isaac said the bar was very crowded at the time when several men got into a dispute at the bar and shots were fired by several people. Isaac said the club does wand and pat down patrons but several firearms made it through security anyway. Cincinnati's police chief says shots were fired by multiple people inside a crowded nightclub, killing a 27-year-old man and leaving 15 other people wounded. Previously, the police counted 14 wounded. Chief Eliot Isaac said at a news conference Sunday that the initial investigation indicates that several Cincinnati area men were in a dispute, leading to the gunfire early Sunday at the Cameo club. Several people were involved. A hospital spokeswoman said two of the wounded are in critical condition; the police chief said one is "extremely critical." Authorities don't believe there is a terrorism link. They are still working to identify the shooters. Ohio's governor says he has instructed his administration to offer any assistance the state can provide in the aftermath of the Cincinnati nightclub shooting. Gov. John Kasich (KAY'-sik) says he is saddened and offers prayers for the victims and families of all involved. One person was killed and 14 others were injured in the early morning shooting Sunday at the Cameo club. U.S. Sen. Rob Portman, of Cincinnati, says his office is ready to help any way it can. He says he and his wife Jane extend their thoughts and prayers to those involved. Both Kasich and Portman are Republicans. Cincinnati city officials plan an 11 a.m. press conference on what the city manager calls a "horrific" overnight nightclub shooting that left one dead and 14 people injured. City Manager Harry Black says police are devoting "all necessary resources" to the case and the investigation is continuing. It isn't believed to be terrorism-related. Authorities say a conflict between at least two people and possibly groups earlier Saturday apparently escalated into gunfire that erupted at 2:20 a.m. Sunday. Black commends first responders who "handled a very difficult situation extremely well." There was a shooting inside the club on New Year's Day in 2015 and in the parking lot in September that same year. A hospital spokeswoman says eight among those injured in the Cincinnati nightclub shooting are being treated at the University of Cincinnati Medical Center. The Sunday morning shooting at the Cameo club left one person dead and more than a dozen injured. Hospital spokeswoman Kelly Martin says one person is in critical condition at the Medical Center, three others are in serious condition, and four are listed as stable. She had no details on the types of injuries or the ages of the victims. Police haven't released any information on possible suspects or whether they have determined the motive for the assault. They say there is no evidence the shooting is terrorism related. Police are now saying only one shooter was responsible for the deadly Cincinnati nightclub assault. Assistant Police Chief Paul Neudigate says in a tweet there was only one reported shooter but police are still investigating. Police earlier had said "at least a couple of shooters" opened fire inside the Cameo club early Sunday, killing one person and wounding more than a dozen others. The motive for the shooting remains unclear, and Neudigate says there is no indication the attack is terrorism related. The shooting occurred on a busy night. Capt. Kim Williams says the crowd there is often very young on Saturday nights and they have had trouble in the past, but "this is the worst by far." A coroner removed a body from the scene shortly after 6 a.m.
Police say there is no indication the deadly shooting at a nightclub in Cincinnati is terrorism related. Assistant Police Chief Paul Neudigate says in a tweet that the motive is still unclear. Police say "at least a couple of shooters" opened fire inside the Cameo club early Sunday, killing one person and wounding more than a dozen others. Capt. Kim Williams says the crowd there is often very young on Saturday nights and they have had trouble in the past, but "this is the worst by far." She says the scene was chaotic when the gunfire erupted. Police are interviewing witnesses. Police in Cincinnati say there were "at least a couple of shooters" who opened fire inside of a nightclub, killing one person and wounding more than a dozen others. Capt. Kim Williams says authorities are not sure what prompted the shooting at the Cameo nightclub early Sunday. She says the crowd there is often very young on Saturday nights and they have had trouble in the past, but "this is the worst by far." She says the scene was chaotic when the gunfire erupted. Police are interviewing witnesses and asking anyone with information to come forward. Authorities do not have any suspects at the moment. WLWT reports that at least one of the wounded is in critical condition at a hospital. Police say 15 people were shot and one person was killed when gunfire erupted at a Cincinnati nightclub. WLWT reports that the shooting was happened about 2 a.m. Sunday at Cameo nightclub. The victims were taken to four area hospitals. Police have not said whether anyone is in custody, and the investigation is ongoing. It wasn't immediately clear what prompted the shooting.